We do currently use Oxygen version 15.1 for our Eclipse RCP 3.6 Client. I just tried to put the new 15.2 version into my Eclipse targetplatform, as I always did with all previous Oxygen releases. From Oxygen 13.1 until 15.1 this worked out seamlessly. I already reloaded my targetplatform several times and tried to clean all projects, but the error still exists. Do you know the reason, or do you have any suggestions to resolve this issue? The error seems to indicate that in the Eclipse classpath you have references both to the com.oxygenxml.author_15.2.0.v2014012017 folder and to the com.oxygenxml.author_15.2.0.v2014012017/lib folder. If you open our plugin.xml, it no longer specifies the set of required libraries. Instead, the set of required libraries are specified in the META-INF/Manifest.mf file. If you look inside that file, it contains a reference to the plugin's lib folder which may explain the problem if in the Eclipse classpath you also have a reference to the parent folder. But our older 15.1 plugin.xml also contained the reference to the lib/ folder so I do not know exactly if this is the cause for your problem. Could you please export all necessary packages, so that I can use them? This seems to work, but actually we really need more. We also use those classes, which still cannot be accessed. Unfortunately that does not work out. Maybe some more packages have to be exportet in order that it works. So could you please tell me, which packages should also be exportet in order to work with those classes I mentioned before? What error do you obtain after adding those other packages? but I cannot yet find a way to specify the same thing in the Manifest.mf, that you want everything to be available. I figured out what was wrong about your MANIFEST.MF file. The "lib/," entry had to be removed from the Bundle-ClassPath: entries and I had to add every Oxygen Package I do currently use. Other Customers might need different ones or less, so it would be best practise for you to just add all of your packages to the Export-Package: entries. If you use the Eclipse embedded Editor for MANIFEST.MF files it is pretty easy to add your packages to the Exported Packages. It's great you found a solution which works. In the next Oxygen 15.2 minor bug fix release those extra packages will be present in the Manifest.mf. For a future version we plan to auto-generate the exported packages list from the manifest based on the annotations we already have on API packages and classes. I'm not sure whether we should remove the lib/ entry from the bundle class path though in the manifest file. Unfortunately nobody seems to remember on our side why it was added in the first place, it was also present in the plugin.xml when we did not use the OSGI bundle manifest approach. 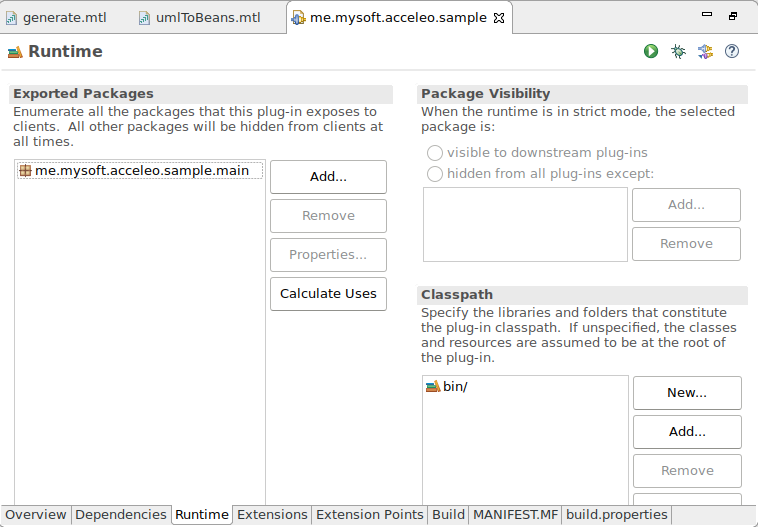 Radu wrote: I'm not sure whether we should remove the lib/ entry from the bundle class path though in the manifest file. Unfortunately nobody seems to remember on our side why it was added in the first place, it was also present in the plugin.xml when we did not use the OSGI bundle manifest approach. So it should be removed, if you do not have a reason for it´s existence in the Bundle-ClassPath:. I know, I was just saying that I cannot yet find the reason why we had that entry there in the first place. It is possible that it was there in order to be able to add in the lib folder a log4j.properties file to enable Apache Log4j logging in the plugin. I will remove the entry for the next Oxygen version (16.0) but I will not remove the reference to it in the minor 15.2 bug fix release because I need more time to see why that reference was there. Our QA assurance team eventually found an issue with removing the reference to lib/, it breaks the loading for the automatic spell checking Hunspell engine. This happens because in the "lib" folder there is a "com/sun/jna" folder from which libraries are loaded by the JNA support. So you should add that reference back and instead try to remove the reference to . (the plugin folder itself). Our original's plugin.xml content did not contain a reference to . and it should have not been added in the first place to the manifest.